Two notifications, similarly-worded, one dated 21 October 1955 and the other dated 27 November 1956, were issued by the Travancore Devaswom Board (TDB). Rule 3(b) of the Kerala Hindu Places of Public Worship (Authorization of Entry) Rules 1965 read: The classes of persons mentioned hereunder shall not be entitled to offer worship in any place of public worship or bathe in or use the water of any sacred tank, well, spring or watercourse appurtenant to a place of public worship whether situate within or outside precincts thereof, or any sacred place including a hill or hill lock, or a road, street or pathways which is requisite for obtaining access to the place of public worship- (b) Women at such time during which they are not by custom and usage allowed to enter a place of public worship. 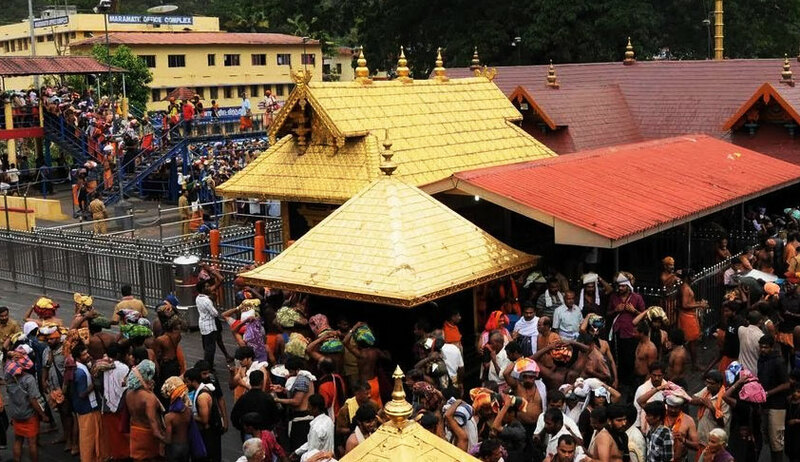 The restriction imposed on women aged above 10 and below 50 from trekking the holy hills of Sabarimala and offering worship at Sabarimala Shrine is in accordance with the usage prevalent from time immemorial. Such restriction imposed by the Devaswom Board is not violative of Articles 15, 25 and 26 of the Constitution of India. Such restriction is also not violative of the provisions of Hindu Place of Public Worship (Authorisation of Entry) Act, 1965 since there is no restriction between one section and another section or between one class and another class among the Hindus in the matter of entry to a temple whereas the prohibition is only in respect of women of a particular age group and not women as a class. The high court did not stop at this. It went on to direct the Travancore Devaswom Board, not to permit women above the age of 10 and below the age of 50 to trek the holy hills of Sabarimala in connection with the pilgrimage to the Sabarimala temple and from offering worship at Sabarimala Shrine during any period of the year. It further directed the Government of Kerala to render all necessary assistance inclusive of police and to see that the direction (not to permit 10-50 aged women) is implemented and complied with. Kerala High Court judgment practically stands overruled/set aside, though none of the judgments specifically say so (because it was not impugned). Only Justice Chandrachud’s judgment seriously discusses the notification. What has the Supreme Court done in the Sabarimala verdict? It quashed the notifications and rules made by the state and held that women cannot be stopped from entering the shrine of Ayyappa. Can state again make such rules by way of ordinance or legislation? Simple answer is no. If made, it will be again struck down, like it was done recently to an ordinance brought in by the Kerala Government. What are the chances of a review petition? Most review petitions are dismissed in limine. Even those considered in open court are not totally reversed unless a glaring error is found out. No new materials or arguments can be brought during review hearing. In a judgment like this, review chances are close to zero percent. Can a larger bench overrule this judgment? Of course, but there is very little chance that such a larger bench will be ever formed. In short, this judgment is here to stay. The Supreme Court has held that women cannot be barred from entering the temple by bringing in notifications/rules etc, but it has not exhorted any women to go to the temple. So the argument that the court is interfering in customs is misplaced because the Supreme Court has only held that there cannot be any statutory provisions which violate fundamental rights. By quashing the Rule/Notification, the statutory protection to an exclusionary custom is taken away by the court. Now we are in the pre-1955 stage when there was no statutory bar of women entry. That means if the argument is that women used to voluntarily abstain themselves from entering the temple, the same may be continued even after this judgment. But the only difference is no one can stop a woman from entering the temple and the state force cannot be used to stop such an entry.